Here is the end of project report for our “Mapping Immigration Controversies’ project. This was an 18 month research project exploring the impacts on local communities and national debate of current publicity campaigns about migration by the UK Home Office, conducted by eight investigators across the UK. There is loads more to read from the project at http://mappingimmigrationcontroversy.com and on Twitter at https://twitter.com/MICresearch. I’m doing a couple of launch events in London next month to celebrate my book coming out. The first event is at The Star of King’s on the 14th October 6pm-9pm and will feature short talks by Professor Les Back (Goldsmiths), Shelagh O’Connor (Director, New Horizon Youth Centre) and I. There will also be records. The second event is a joint launch with Susanne Wessendorf for her book ‘Commonplace Diversities‘ hosted by Suzanne Hall, (author of the brilliant book ‘City, Street, Citizen‘) at LSE Cities on the 22nd October 6.30-8pm. No booking is required for either of these, just come along. A group of young homeless people sit around a large map of London. Gradually, they start to write on it with felt tip pens. They mark hostels, bus routes, friends’ flats, ‘no-go’ areas, parks, football grounds. This exercise was part of an ethnographic research project that took place in a London day centre between 2007-2010 (complemented by further interviews with staff in 2014) that forms the basis for my new book,Young Homeless People and Urban Space: Fixed in Mobility. The book provides an examination of how homeless spaces and the city are lived, perpetuated, and experienced by young people in London. It is about what happens to young homeless people once they are homeless, and how they navigate both the city and the homeless system. High levels of homelessness in London are longstanding; for example, in 1968 London contained about 6 per cent of the population of England and Wales and 37 per cent of these country’s registered homeless people (Greve et al. 1971). While speaking of ‘homelessness in London’ might conjure images of the cardboard cities of the 1980s, rough sleeping, though still part of the landscape of homelessness in London (and on the rise), is not the whole story. This book moves beyond a focus on street homeless people in order to reveal a more complex set of geographies and experiences. My study found experiences of homelessness varying from the young Somali woman who conceals her homelessness from friends and family, to the young man trying to escape street life in east London and continue his college course while sofa surfing, to the young man of Irish parentage recently released from a young offenders institution struggling to rebuild his life while living in a hostel. While these young people have very different lives, they are all negotiating homelessness in London. The day centre is a place where these stories intersect and where advice and advocacy is provided. However, place of origin and migration status have impacts on what can be accessed and by whom within the homeless and welfare systems. Access to the welfare state is key to the ordering of homeless experience in the city. Young homeless people are ‘in’ or ‘out’ of the social security safety net and the hostel system, depending on whether they have ‘recourse to public funds’. To be ‘in’ comes with constraints and expectations, but to be ‘out’ is to be made dependent on a network of soup kitchens and cold weather shelters that are not linked to the receipt of benefits and cannot provide stable accommodation. Even for those who are ‘in’, the constraints are tightening. In the book I argue that the increasingly localised provision, as enshrined in the local connection policy, of homeless services is out of step with the complex and mobile lives of young homeless people. This trend of localisation has since further intensified. Recent interviews with staff from 2014 pointed to the local connection policy being extended, for example, to mental health services. There has also been a gradual reshaping of what homeless people are expected to do in hostels and day centres. This is compounded by organisations coming under increasing pressure to deliver ‘hard outcomes’ to funders. Housing is recast as no longer a right but as something to be worked on. Homeless people must bid for social housing rather than wait on a housing list. They must participate in training and work on their CVs. This is an attitude that is in part reproduced by young homeless people themselves, particularly in their accounts of how they have fared in the hostel system. However, this is not the full story. Homeless spaces like the day centre have not merely been made in the image of neoliberalism. Shifting funding and policy objectives impact on homeless services but such measures are interpreted and mediated by staff. The day centre is also negotiated, and to some degree co-opted, by the young people who use it. It has become a place of activity and of improvement, but for many of the young people who were part of this study it is returned to over and over and represents stability. From here, the book follows young people’s accounts of moving through and coping with public space in London. Previous research has emphasised the difficulty for young people in claiming and occupying public space. This problem is multiplied for the young homeless person, who has even fewer options of place to go and is more likely to come under surveillance from the police. In addition, for many young homeless men, peer surveillance and territoriality makes moving between areas of London difficult and dangerous. They find themselves unable to return to their own area but also constrained in where they can safely go in London. I argue that young homeless people are fixed in mobility, kept in a perpetual state of being on the move. Lingering in public space is dangerous and trips between the hostel, day centre and jobcentre are necessary in order to get food and shelter. Being fixed in mobility also refers to being fixed in the present. It is difficult for young homeless people to ‘move on’ into education or employment while they are in this situation. Young homeless people have dreams and aspirations. These are not grandiose, but are often just tantalisingly out of reach. Being a plumber, a youth worker, working in a kitchen. Young homeless people talked about pursuing their futures ‘when my housing’s sorted’. Ultimately, until there are options for more affordable housing in London, for many the moment of ‘when my housing’s sorted’ will continue to hover in the middle distance. During the main period of research (2007-10), media reports of the recession were affecting the expectations of young homeless people about their chances in the labour market but the coalition government and their roll out of austerity measures was yet to come. Since then, entitlement to benefits has become even more precarious. Young homeless people are being heavily hit by benefit sanctions. Research from Homeless Link found that although 3 per cent of those claiming Jobseekers Allowance were sanctioned, this rose to a third among homeless people. One staff member I interviewed in 2014 told of a young man walking eight miles each way every day to from a North London suburb to central London just to be able to get food. These increasingly punitive welfare policies radically transform young people’s lives and the possibility of accessing the city, or a future. In 2003, local authorities became responsible for constructing ‘Single Homelessness Strategies’ to supply emergency accommodation for homeless people with a local connection. Building on the ‘local connection’ policy introduced in the 1977 Housing Act, this development made local authorities responsible for awarding funds through the ‘Supporting People’ fund to (competing) hostels, specifically to provide accommodation for homeless people from their own borough. Consequently, hostels started to safeguard space for, and prioritise, those with a ‘local connection’. 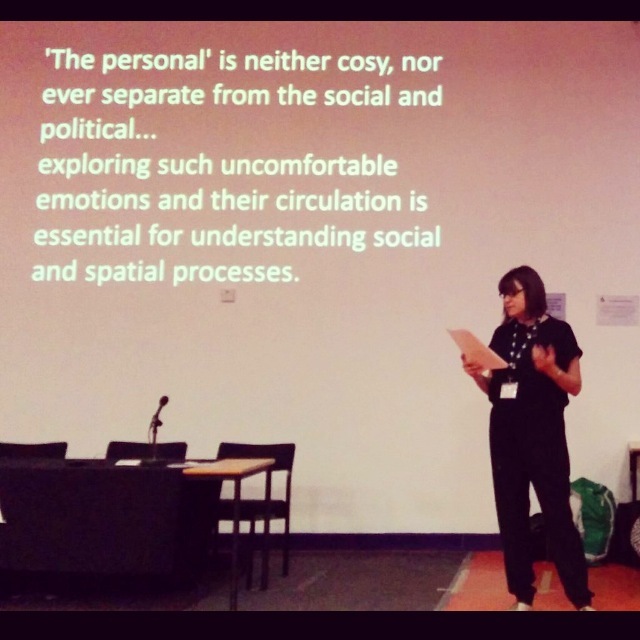 I’m a lecturer in Sociology at Goldsmiths, University of London interested in how people make a place for themselves in and across places. What shapes, enables and limits these spatial practices? How do these practices intersect with other forms of power, control, histories to produce spaces? How do everyday spatial practices impact on a person’s sense of self? Previous research projects have included ethnographic research with young homeless people in London and an examination of the relationship between the middle classes and the city in Paris and London. I’m currently working on two ESRC funded projects. ‘The Choreography of Everyday Multiculture: Bowling together?’ is funded through the Future Research Leaders scheme. This research examines the dynamics of contemporary leisure space in the context of changing discourses of what makes ‘good’ urban space and processes of urban change in London. I’m also a co-investigator on the project ‘Go Home: Mapping Immigration Controversies’ exploring the impacts of recent anti-immigration campaigns coming from the UK government. This blog is an attempt to pull together the work I do across different projects (and will no doubt also come to host musings on films, urban encounters, maybe even scones). Before any of this I was a bass player, a record shop assistant and a cinema usher.